Tokyo is a city where old and new collide—a place where traditional ceremony and classical architecture meet modern technology and futuristic fantasy. You haven't really seen Tokyo until you've experienced both sides. See below for your options. Japan has a rich culture of ceremony and tradition dating back centuries, and this heritage remains visible in Tokyo today. Take part in the intricate ritual of a tea ceremony, learn to make sushi the traditional way, or watch some sumo wrestling. The city's history comes alive in neighborhoods such as Ryogoku, a sumo wrestling hotspot, and Asakusa, one of the oldest areas in Tokyo and home of the seventh-century Sensoji Temple. While Asakusa feels like an ancient neighborhood frozen in time, Akihabara Electric Town looks right out of the future. This modern neighborhood—quintessentially New Tokyo—is also at the epicenter of Japan's cosplay, karaoke, video game, and comic book culture. 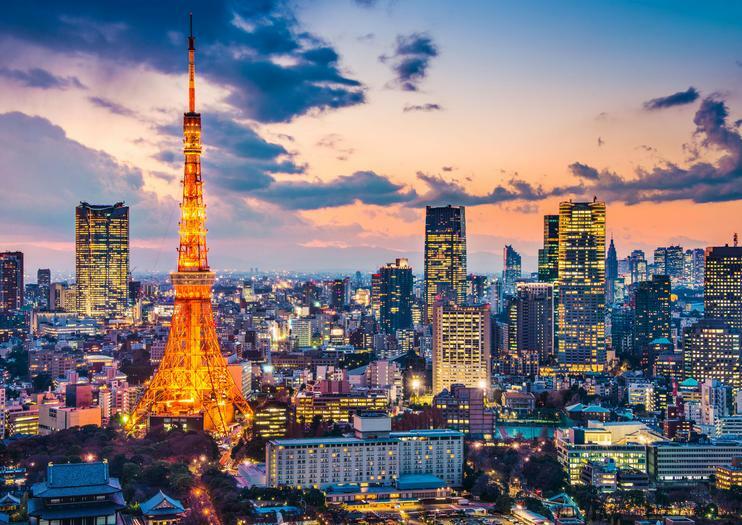 The city's architecture speaks to its position as one of the world's greatest modern metropolises, and you can get some of the best views from the Tokyo Tower's 476-foot (145-meter) observation deck. Take a fascinating 'deep dive' into Japanese seafood cuisine during this 3-hour combination walking tour of Tsukiji Outer Fish Market and cooking class. Shop for the freshest ingredients amidst the labyrinth-style aisles of Tsukiji Outer Fish Market, showcasing everything from sushi-grade tuna to octopus tentacles. Then head to the largest gourmet cooking school in Asia as you learn to prepare traditional-style ‘washoku’ food items like sushi and a Japanese omelet. An English-speaking guide, transport, cooking ingredients and tools and lunch with a beverage are all included. Get acquainted with a real-life geisha during a 1.5-hour cultural experience in Tokyo. An intimate encounter designed for travelers interested in Japanese culture, this tour includes a geisha performance, traditionally featuring songs, dances, and games, and refreshments such as tea and sweets. Learn about the history of the geisha and upgrade to include lunch and unlimited drinks. Feel like you’re big in Japan during this 2.5-hour tour of Ryogoku (sumo town) and the historic Asakusa district led by a sumo wrestler. Follow your hulking host as you check out the Ryogoku kokugikan sumo stadium, see where the wrestlers practice and visit a sumo goods shop. Then head to Asakusa, where you’ll check out the iconic Senso-ji temple, sample some snacks and shopping on Nakamise Street and much more. A translator and sumo guide are both included. Explore the steel and glass jungle of Tokyo in a new light during this photography workshop. Improve your composition techniques with the help of a local photographer who joins you on an adventure in two Tokyo neighborhoods: Shimbashi and Ginza. Capture skyscraper-strewn landscapes and dramatic views of the city’s architecture. This small-group photography experience, perfect for novices and experts alike, is limited to six participants.